On Februay 13, 2019, the Chisholm Trail 100 Club (CT100) approved the addition of 509 Hood County First Responders to the organization’s service area. All Hood County First Responders are now provided all of the benefits of the CT100 organization - which includes $50,000 line of duty life insurance, serious injury benefits, off-duty life and injury benefits; as well as various scholarship opportunities. Prior to the CT100’s Board approval to add in Hood County, the CT00 covered the 1,400 FIrst Responders in Johnson County, Somervell County and the City of Mansfield. The agencies/departments now covered by CT100 include the law enforcement agencies and departments - which include the Hood County Sheriff’s Office, the Granbury Police Department, the Hood County Constables/deputies, Lipan City Marshal; the Department of Public Safety, the Game Warden, and Texas Rangers serving Hood County; the Hood County fire department personnel (including the nine volunteer fire departments, as well the Hood County Fire Marshal and deputy marshals); the Brazos River Authority Lake Rangers serving Hood County; the Hood County Emergency Management Director; the ambulance service providers contracted within Hood County. The Chisholm Trail 100 Club is dedicated to supporting the First Responders of Johnson and Somervell Counties, Texas. Currently we provide a $50,000 line of duty life insurance to over 1,900 Law Enforcement Officers, Fire Fighters, Correctional Officers and Emergency Medical Personnel, we also provide up to $50,000 for line of duty serious injuries; as well as providing up to $25,000 for off duty accidental deaths and injuries. All of our benefits are 100% paid for by our members and corporate donors. 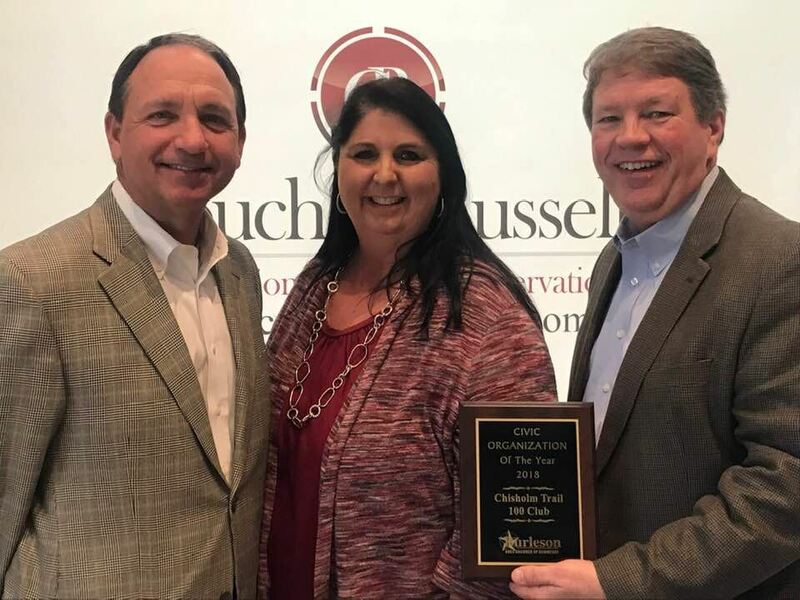 Chisholm Trail 100 Club named "Civic Organization of the Year 2018" by the Burleson Area Chamber of Commerce at the BACC's Annual Awards Luncheon on February 22! Thank you BACC for the recognition of what the Board of Directors, leadership and members of the Chisholm Trail 100 organization have built since 2009 to support the First Responders in our area! We are proud to "stand in the gap" for the 1,900 first responders in Johnson County, Somervell County, Hood County and the City of Mansfield! Are you donating for expansion for a specific area? The MAAD Hunter Venture Capital Group Inc. Scholarship is available to graduating seniors of first responders in the Chisholm Trail 100 Club's covered area. This scholarship is a $1,000 scholarship, renewable annually if criteria are met. Own a piece of history with the newly available print from Texas Legend, Gary Crouch. Gary has custom designed this piece to showcase the efforts of the Chisholm Trail 100 Club! 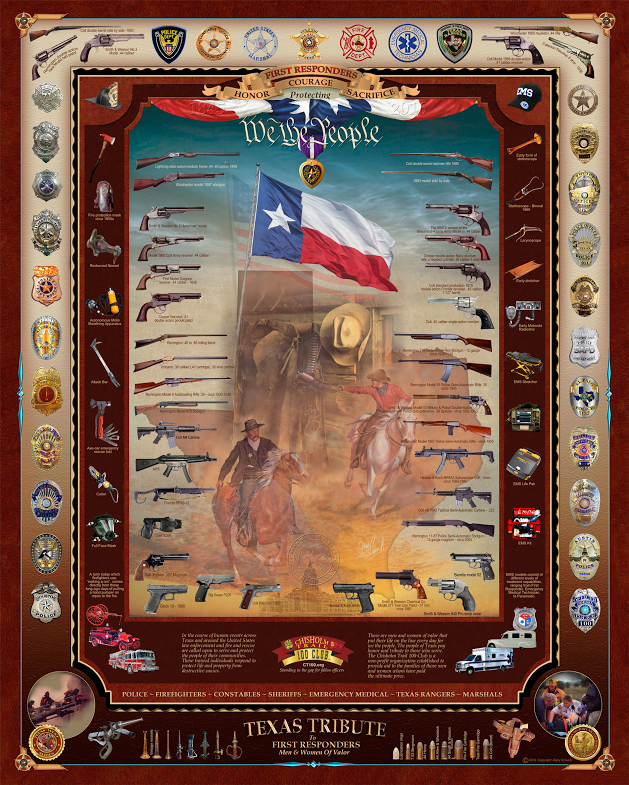 This print features badges of CT100 Club covered police and fire departments, as well as other departments throughout the state of Texas. Also featured are weapons utilized by law enforcement, equipment used in firefighting and more. This print includes the Chisholm Trail 100 Club logo, something completely unique! Proceeds benefit the CT100 Club. Proudly display your support in your home or office today! The Chisholm Trail 100 Club is proud to present our new Awards Program! We have two different award types, The Chisholm Trail 100 Club Award, given for extraordinary service or valor in the line of duty, and the Lifetime Achievement Award, given for 20 years or more in the Johnson County area. All Johnson County First Responders covered by the Chisholm Trail 100 Club are eligible to win this award, nominations are put forward by peers, which are then reviewed by an Awards Committee. Awards are not intended to be given every year, and may not be not be awarded even if nominations have been made. If you have any questions, please contact Executive Director, Cara Ellison. Nominate a First Responder for an Award Here. Help us save for a rainy day. The Chisholm Trail 100 Club has an Endowment Fund specifically set aside to help us grow in the future. These funds are designed not to be used for day to day function, but purely as an investment into our future. If you are interested in donating directly to the endowment fund, you can donate here, or mail a check with "Endowment Fund" on the memo line to PO Box 332 Burleson, TX 76097. Shop on Amazon.com often? Select CT100 Club as your charity of choice on Amazon Smile, and Amazon will donate a portion of select portions back to us!